Physical appearance and body image have been and continues to be a topic of conversation, whether in eating disorder recovery or not. Over the years, there has been continued focus on weight, fitness and diets. However, our culture is also becoming more active in body positivity and normalizing self love. Seeing more diverse body types being featured in different campaigns, magazines, commercials and social media coupled with more professionals becoming versed in Health at Every Size is exciting and relieving. Improving body image isn’t necessarily about falling in love with your body’s physical appearance. We are flooded with images of what some of us might define as “beautiful.” Most of us find ourselves scrutinizing some aspect of our appearance, whether it’s our weight, height, hair, eye color, body shape and the list goes on. So, loving every single aspect of ourselves is a challenging feat. But what if we were able to see beyond just our appearances, and honor those pieces of ourselves? During this year’s NEDA week, I found a great exercise by Ashlee Bennett, The Body Image Therapist. The exercise stated: “I’m more than the way my body looks because…”. I left it out in my waiting room for my clients to fill out and place their answers on the mirror on my wall. The interesting part of this exercise was that many people often didn’t stop to think about their body’s outside of their appearance. Many were stumped and took a while to really think about their answer. However, in the end, it proved to be an awesome and rewarding experience. When treating my clients, exploring who they are and what their body’s can do is how we work towards improving body image. Our bodies are our own personal vessel. How we treat it in all aspects; nutritionally, emotionally, spiritually, physically, is what we ultimately want to work on. Obsession about one’s appearance and in the case of an eating disorder, where preoccupation with food, weight and body image is the focus, there is little room for much else. Healing opens the space to explore those pieces of ourselves that they’ve been disconnected from. Reconnecting to one’s body requires the practice of being mindful, that is acknowledging your thoughts, feelings, and body sensations without judgement. Being mindful requires practice, but it will help you figure out what feels good and what doesn’t in your body. From an eating disorder recovery perspective, this is helpful with helping clients who are really trying to figure out what foods they truly enjoy, and which foods feel good in their bodies, as opposed to moralizing food groups as good or bad. Instead, they can identify which foods taste good, give them more energy and focus. Eating disorder or not, food is one of the many ways we nourish our bodies and mindfulness to this is helpful. The same concept goes for physical movement. Helping people connect to what feels healthy, as well as doing something they enjoy are key elements in choosing physical activity that is right for their bodies. For some that may be a leisurely walk, a yoga class, dancing or sleep. Paying attention to what your body needs is key is self-care and body acceptance. I also try to emphasize the function of our bodies when moving beyond our appearance. I often have discussions like this with my 11-year-old daughter and have done so since she was old enough to understand, but also in my work with clients. For example, when a young client has been upset over the size or shape of her legs, we’ve talked about what the function of her legs are, aside from how they look. We might talk about her ability to dance, run around with her friends or family dog. For the mothers I treat, who become pregnant, we discuss the miraculous capacity for our bodies to not only create life, but to house another living being. For parents, I feel that helping your children understand and respect the function of their bodies is a useful conversation to have especially if you are trying to encourage self-care, proper eating habits, physical activity and body acceptance. Focusing on what feels healthy as well as honoring the function of our bodies is beneficial in becoming more body accepting. But who are we outside of our physical selves? What else nourishes you and makes up who you are? What defines you? Outside of your physical appearance are your passions, who you are as a person and what you value about yourself. Self- care is not just about physical nourishment and activity, but how we also nourish ourselves in all other aspects of our lives. Practicing being mindful to these parts of our being is also very important in body acceptance and self-esteem. Becoming more body accepting is no doubt, a challenging task, especially in a world that gives such mixed messages. Learning to practice being more mindful to what feels healthy and nourishing in all aspects of your life will help improve your relationship with your whole self. Honoring our bodies as well as what define us is what makes us unique and truly beautiful. Dianna is a psychotherapist specializing in the treatment of Eating Disorders. Her mission is to help individuals navigate through the recovery process by developing a healthier relationship with food and their bodies while nourishing their whole self. Dianna has been practicing psychotherapy for 18 years and is currently working in her own full time private practice. Dianna also believes in advocacy, education and prevention of eating disorders. 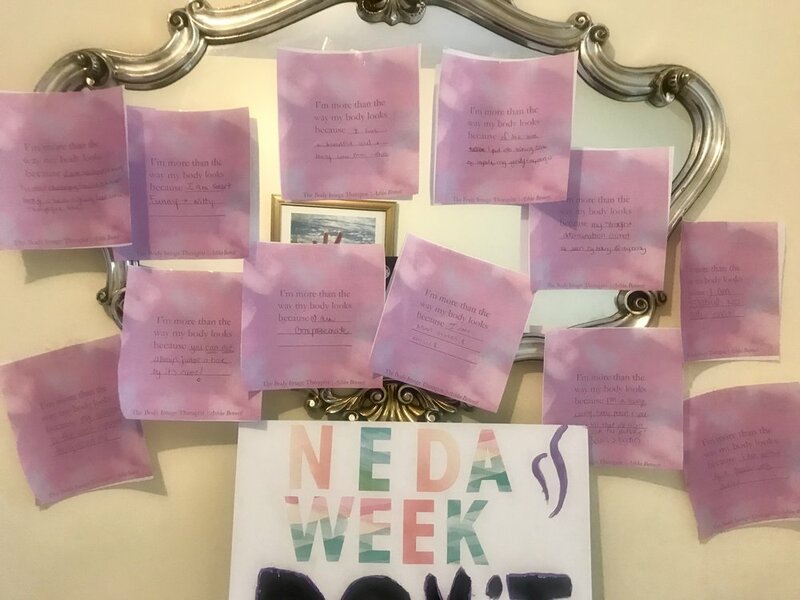 She has partnered with NEDA and the EDC to Washington, DC and Albany, NY to lobby for changes in legislation regarding eating disorder prevention, awareness and treatment. Annually, she plays an active role in National Eating Disorders Awareness Week spreading awareness through blogs, literature, videos and social media. Dianna has been a frequent writer for NEDA and her own personal blogs spreading awareness through her own recovery journey. Start Spreading the News-But How?